Dower chest carved 1937 for Wanda Piesse . Who was Nellie Payne? Dower chest for Wanda Piesse. (Josephine) Wanda Piesse was a good friend of Nellie’s. The Piesse family were in the shipping and freight business at 70 Elizabeth Street, Hobart (currently the Tourist Information Office). Wanda’s sister Jean Seager also owned the original Wainwright painting “The cutmear twins” which was later purchased by the Fitzpatrick’s sisters of Westbury who later sold it to the National Museum . 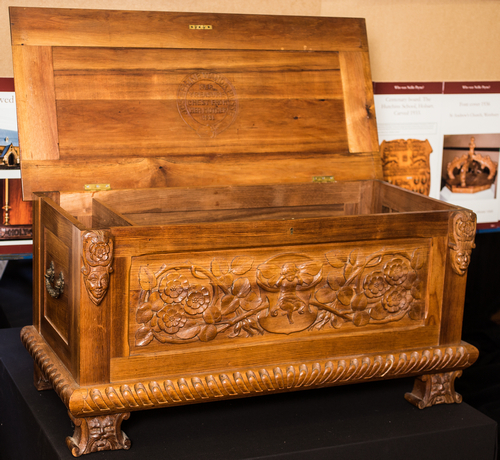 Nellie carved a dower chest for Wanda’s wedding to David Logan in 1937. This was highly valued by Wanda and she has left it in her will to one of her grand daughters. Also of interest is the fact that Antony Logan won the Alan Field Payne Award at Hutchins around 1989. In the newspaper article of 27th October 1937 in the photograph of Wanda and David’s wedding, the lady on the right hand side, Patricia Walsh later married Bill Hodgman, therefore she is the current Premier, Hon. Will Hodgman’s grandmother.